Baroness X sure loves her fans. She gave us Doomfire, and Sir Cockicorn, and now Vulcan. I think this might be my favorite one yet...and I am not usually a blue fan. 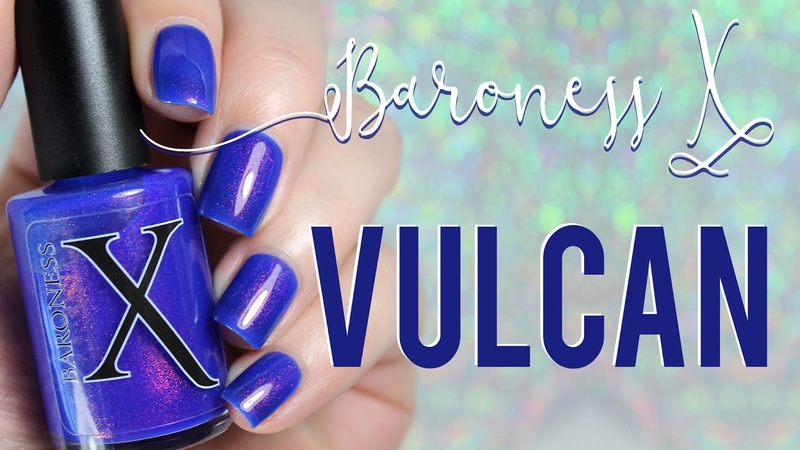 Vulcan is a vivid cobalt blue jelly polish filled with the mythical Unicorn Pee pigment. 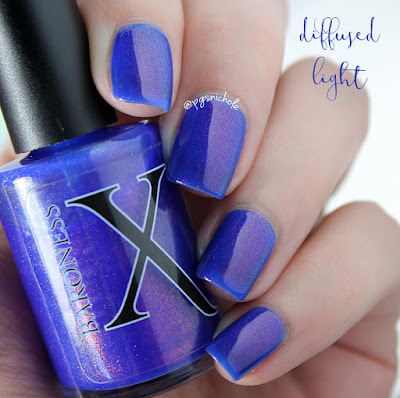 Yes, that same pigment that gives such fire and life to Max Factor Fantasy Fire and Doomfire...as well as the Ex Libris collection from last year. That signature shift from electric rosy violet to copper and green is pretty singular in the nail world, and as far as I can find...you can't buy it anymore. Even eBay seems barren today. Long story short, the pigment is hard to find. I used three medium coats over a clear basecoat for these pictures, and then followed it up with a layer of Seche Vite. To make this color go further, you could definitely layer a coat or two over a vivid blue like Pacific Blue (which I used as a base for this manicure). But it is nice to see what it looks like alone too. In the pictures here, I definitely see a bit of nail line, but in person it was a lot less obvious. This shot below, where I diffused my light a bit, is more indicative of what it looks like under normal conditions. My goal for 2017 is definitely going to be to create a better lighting set-up to catch the shifters. So this is natural, but indirect, lighting courtesy of my garage. You can see the coppery glow here best. I could look at this polish all damned day. I even layered it over DoomJelly, which is Doomfire without the fire...but you'll have to wait for that. Have you joined the Army yet? We have all the shiny things, Vulcan included! haha I didn't want to flaunt the Nerd Flag that hard on a Monday! Oh my... this is gorgeous! I really, really need to get my hands on some Baroness X babies! 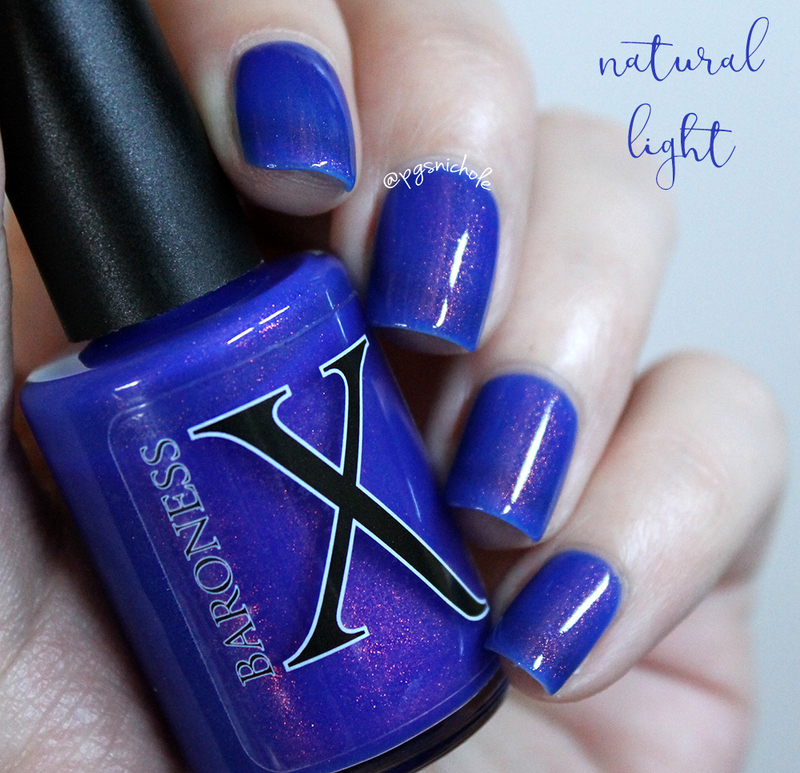 Such a bold, vibrant blue! Gorgeous!!! Man that's beautiful. I want! This color is so freaking gorgeous! That is gorgeous! 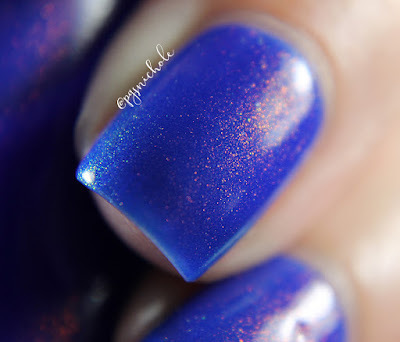 I love the blue with the shimmer. GORGEOUSSSSS. You make me want everything from Baroness X! I love anything blue, go figure. Your photos are beautiful. I'm not sure yet if I prefer Vulcan to Doomfire. But it is an absolute must have. I love it so much. Beautiful! I don't actually own anything with the Unicorn Pee effect. I want in on this one! I'd happily drown in this. I wish I could get my hand on that pigment. Or any polish with the effect. They seem to sell out before I get to hear of them LOL. My gosh -t hat polish is a stunner... beautiful. This is so gorgeous! 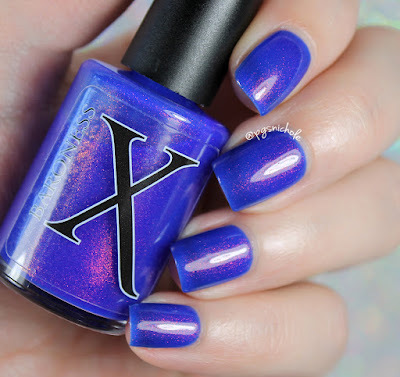 Wow, that shimmer! This is coming to me in the next day or so, along with the August MMM and another Cockicorn. My eyes might explode.